Triad’s Bailey Perry (12) gives chase as Cedarville senior Maggie Coe drives in for an easy layup, Jan. 24, against Triad at Cedarville High School. Cedarville senior Sydney Wright (10) loses her defender on a forced switch with her teammate Maggie Coe in an Ohio Heritage Conference girls high school basketball game, Jan. 24 against visiting Triad. 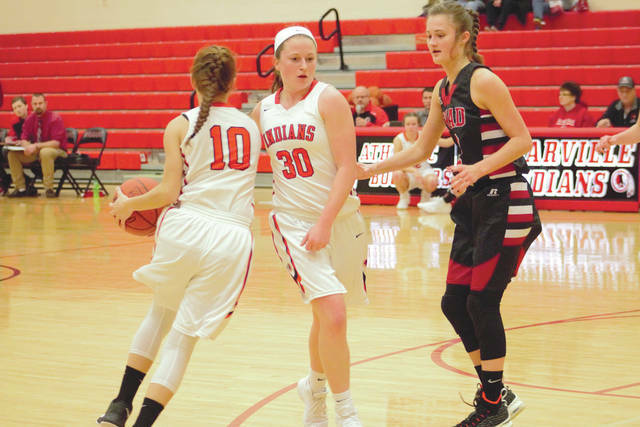 CEDARVILLE — Maggie Coe and most of the starters for the Cedarville Indians high school girls basketball team were on the bench for most of the fourth quarter, but they were putting just as much energy into cheering for their teammates as they did playing the actual game. Cedarville defeated their Ohio Heritage Conference opponent, the Triad Cardinals, by a score of 63-36, Jan. 24 at Cedarville High School. The girls on the bench were regularly jumping up and down and cheering on their teammates who do not always get as much playing time. Cedarville coach Josh Mason said that team unity has been an important part of their season and it was evident the girls had bought into that. “If you focus on enjoying every second while you are together, good things usually happen,” Mason said. 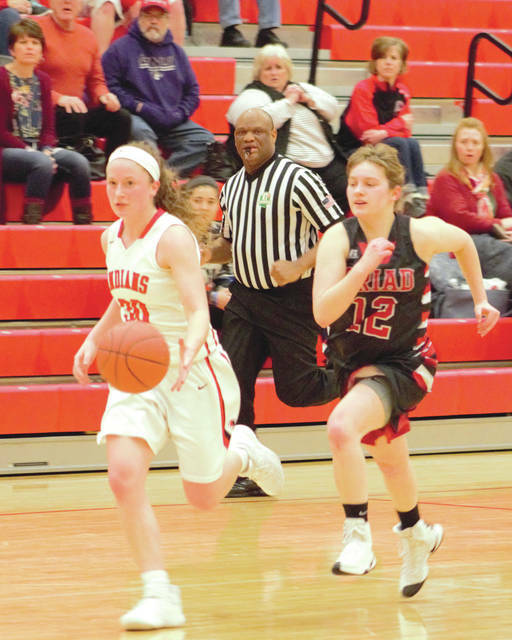 Coe led the Indians (10-5, 6-4 OHC South) with 18 points on the night. Triad is now 7-9, 3-8 in the OHC North. Mason said Cedarville had gotten away from enjoying the game a little bit this season, but they are focused on making sure they enjoy every second of the rest of the season. The team had a conversation among themselves about their approach and have shifted their focus to really enjoying their time as a team and hoping the wins will follow. The Indians have a tough stretch with multiple games close together to end the season. They will play seven games in 12 days and the team will be tested, but Mason said the team should be ready for the challenge. The Indians will begin the long stretch against Greenon at 2:30 p.m., on Saturday Jan. 26 at home. Triad will host West Jefferson that same day, but at 7:30 p.m.
“We have eight games left, and our goal now is to enjoy every second of it,” Mason said.